Viewpoint Tickets - Best prices on Phillies tickets, MLB tickets and MLB All Star tickets. Location: Home plate (S), Pattison Avenue; 1st base/right field (E), Darien Street; center field (N), Hartranft Street; 3rd base/left field (W), 11th Street. Dimensions: Left field line: 329 ft.; power alley: 369 ft. (2004), 374 ft. (2006); LF corner: 385 ft. (2004), 390 ft. (2006); inner corner: 381 ft.; left of CF: 409 ft.; center field: 401 ft.; right of CF: 398 ft.; RF power alley: 369 ft.; right field line: 330 ft. Fences: Left field line: 9.25 ft.; LF power alley: 8 ft. (2004), 10.5 ft. (2006); LF corner: 12.67 ft.; inner corner: approx 13.33 ft.; left of CF: 14.25 ft.; center field: 6 ft.; right of CF: 6 extending up to 13.25 ft.; RF power alley: 13.33 ft.; right field Line: 13.33 ft.
A new ballpark for the Phillies has been constructed just east of the site of Veterans Stadium on the north side of Pattison Avenue between 11th and Darien Streets in South Philadelphia and spans a 21-acre site. The ballpark structure is situated uniformly within the city street grid. The structure of the ballpark is formed by multi-story buildings containing fan facilities, team offices and services that surround the grandstand bowl and face 11th Street on the west, Pattison Avenue on the south and Darien Street on the east. On the north, lower scaled buildings parallel Hartranft Street and create an open-air concourse. At the four corners of the site, landscaped entrance plazas open the park to the street. Each of these entrance plazas have a distinct character and focus, echoing the City of Philadelphia design plan with its four unique squares. The ballpark's exterior design combines the essence of Philadelphia's rich tradition of sports architecture with an unmistakably modern 21st century style. As it faces the street, the ballpark is clad in brick and stone. Arcades on the south and west provide shadow and shelter. Parallel to home plate, third base and first base, glass enclosed 50-foot high lanterns glow at night. Approaching the corner plazas, the steel framed seating bowl and lanterns flank the primary entrances. The street-level entrances lead directly to the airy main concourse and an open view to the playing field. With the Philadelphia city skyline as the backdrop, the new ballpark features "bowl-style" seating with the playing field scooped out 23 feet below street level. The seating bowl layout is inspired by the classic plans of the Baker Bowl, home of the Phillies until 1938 and Connie Mack Stadium (formerly Shibe Park), which housed the team until 1971 when they moved into Veterans Stadium. Like Connie Mack Stadium, the upper and lower decks do not correspond exactly in plan. The cantilevered steel structure of the park allows for more open seating areas. The cross section of the ballpark is configured to place fans on top of the action. Less than one-third of the seats are in the upper deck. To allow for a view of the downtown skyline, the field is oriented with home plate to the south and the outfield to the north, 45 degrees counter-clockwise from Veterans Stadium's orientation. The facility features numerous amenities including family entertainment areas, open concourse concessions, and accommodations to provide for comfortable accessibility for the handicapped. Situated close to the action - a mere 13 feet above street level - all suites are located between the foul poles with 60 percent of the suites placed in the infield. There are twenty thousand parking spaces near the ballpark. The ballpark is directly accessible from the Broad Street Subway Line. Entry to main concourse is at street level. Seventy-two luxury suites, thirteen feet above the main concourse, are all located between the foul poles. The mezzanine club level, consisting of 6,600 seats, is twenty-one feet above the main concourse. The lower bowl consists of 21,000 seats, including 1,164 Diamond Club seats located directly behind home plate. The playing field is visible from outside ballpark. Side-by-side bullpens on two levels are located in right field. 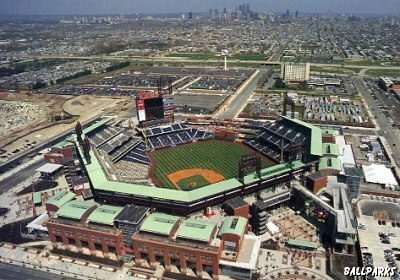 Aerial view of Citizens Bank Park © 2004 by Mike Smith. 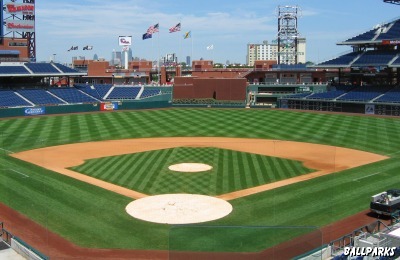 View of Citizens Bank Park from behind home plate © 2004 by Joe Siegler. 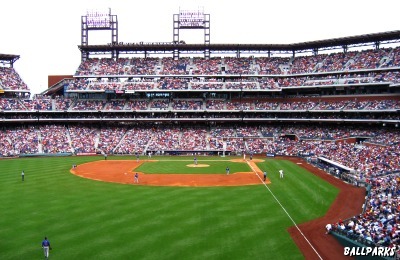 View of Citizens Bank Park from left field © 2004 by Joe Siegler. 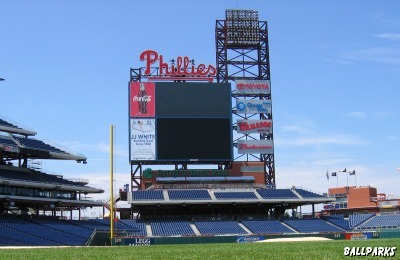 View of the Citizens Bank Park scoreboard © 2004 by Joe Siegler. Tickets to Phillies Braves, Phillies Mets, NCAA Basketball Tournament, College Football Bowl, NCAA Football, Philadelphia Eagles, Paul McCartney and Philadelphia Phillies provided by Ticket Triangle.